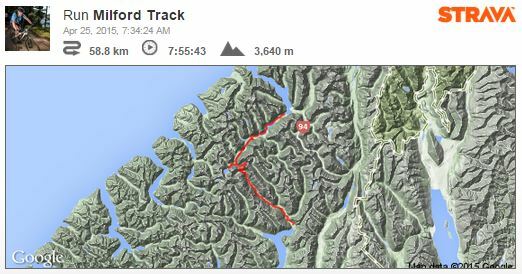 April 2015 we headed to Te Anau to run the Milford Track. We had a fun side trip to Highland Motor Sport park, wow what a facility. Andrew smoked us on the first round of the Go Karts with Anthony getting revenge the second time round. Anthony aka Whippet sorted out a great pad Birchwood Cottages, we sorted out some good home cooking for dinner and prepared our special sandwiches for the next day. Anthony’s mate Sam had arrange Blue to take 7 of us to the start of the track at Glade Wharf in his boat, leaving Te Anau Downs at 6am, we headed out from the Wharf in the dark after stashing some beers in the lake for our return. The Milford Track is a widely known tramping (hiking) route in New Zealand – located amidst mountains and temperaterain forest in Fiordland National Park in the southwest of the South Island. The 53.5 km hike starts at the head of Lake Te Anau and finishes Milford Sound at Sandfly Point, traversing rainforests, wetlands, and an alpine pass. The native Māori people used the Milford Track for gathering and transporting valuable greenstone. There are many Māori legends about the track and the native species found in it. Donald Sutherland and John Mackay were the first European explorers to see what are now known as Mackay Falls andSutherland Falls, in 1880. With Milford Sound never really having an industrial or agricultural future, most visitors and investors from early on decided that tourism was to be the main draw to the sound, and the Milford Track was established to a large degree to provide a tourism function for guided treks. The track was very famous with women from early on. Some parties consisted of three-quarters females even in the first half of the 20th century. For a great length of its history, only commercial companies had the right to be on the track. Only later did the ‘Freedom Walker’ movement, led by New Zealand’s alpine and walking clubs, force a compromise which allowed individual, non-guided tours on the strictly “rationed” route. Today, the quota system allows approximately half the “capacity” of the track to be used by guided tours while the other half is undertaken by people walking on their own or in informal groups. Both groups use separate systems of huts. Due to its popularity and the limited facilities available for overnighting (camping is not permitted), the track therefore remains heavily regulated. During the summer peak season of late October to late April, access to the trail is highly regulated. Walkers must complete the track in four days, travelling only in the northward direction. Camping is prohibited on the trail. Walkers can tramp the track independently, or as part of a more expensive guided walk with a guide company. A maximum of 90 walkers can start the trail per day (40 Independent, and 50 Guided). Usually these 90 places are booked out for many months in advance, despite the high cost of the guided walks. Due to the one-way ticket system and limited hut capacities, trampers need to keep moving even during bad weather. During periods of especially heavy flooding, the DOC regularly calls in helicopters which fly trampers over flooded sections of the track at no further charge. If hiking independently, each night must be spent in a hut owned and maintained by the Department of Conservation. The huts for independent walkers have basic facilities, which include bunk areas, restrooms, and cooking facilities; walkers have to carry their own equipment and food. On a guided walk, walkers stay in lodges owned and operated by Ultimate Hikes. These lodges have facilities such as hot showers, catered meals, beds, lounge areas, electric lights, and drying rooms. Guided trampers need only carry clothing, toiletries, their sheets, and lunch while on the trail. Guides walk with trampers, providing as little or as much assistance as required.